A fast start will be crucial when the NZ Motocross Nationals start on Sunday at New Plymouth, defending champion Cody Cooper says. KTM are again bringing top Australian riders to the New Zealand series with Kirk Gibbs and Luke Styke aboard the orange machines. Australian rider Jacob Wright (Yamaha), Japanese rider Yu Hirata (Yamaha) and US racer Eric Senk (Kawasaki) are also competing in MX1. "My fitness is good and the strength in my leg is improving all the time," said Cooper. "I'm expecting some close racing and I've been working on making consistent starts because getting a good start is going to be really important. "New Plymouth has a concrete start pad and I was pretty average at Whakatane (at December's Summercross event), which has a concrete start." Taranaki Motorcycle Club hosts the opener of the four-round national series at the Barrett Rd track, near New Plymouth, on Sunday. The defending MX2 champion is Yamaha rider Kayne Lamont (Mangakino). His preparation was interrupted by a crash at the Whakatane Summercross but was back in action at the Woodville event. Lamont's main rivals include Honda's Michael Phillips (Rotorua), Micah McGoldrick (Amberley) and Cam Dillon (Taupo) while Suzuki's MX2 bid is headed by Te Puke's Logan Blackburn and Dunedin's Campbell King. Rotorua's Scotty Canham and Napier's Kieran Scheele are Kawasaki's strongest MX2 riders while Hadleigh Knight (Atiamuri) will ride for Husqvarna. Two Australian riders are in the MX2 entry list - Jay Wilson (Yamaha) and Luke Arbon (Husqvarna) - while young British rider Rob Holyoake returns for his second Kiwi campaign riding a KTM. Hamilton teenager Josiah Natzke will be alone in riding two classes - looking to defend his 125cc 2-stroke crown and also chase success in MX2 before heading to a European championship ride. Natzke's double title bid will be an endurance test but the 16-year-old has prepared by riding in two classes at most of the major events already this summer. Natzke is a likely front runner in MX2 and a clear favourite for the 125cc title, where his most likely rivals are Yamaha's Courtney Duncan (Palmerston) and Wyatt Chase (Taupo), Honda rider Jacob Steel (Te Awamutu) and Benjamin Broad of Ngatea, who has just switched to a KTM ride. 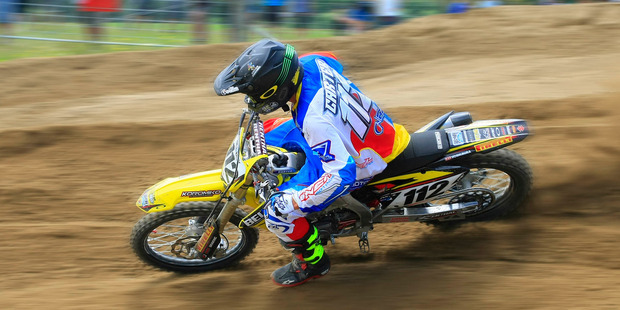 The Motocross Nationals are raced over four rounds with three races per class at each venue.